“I like beer!” Whether this truism was uttered by Homer Simpson or a nominee for the Supreme Court of the United States it echoes the 43% of Americans who list beer as their preferred choice when selecting an adult beverage. This has given rise to a phenomenal increase in the number of breweries around the world and in the U.S. There are currently over 7000 breweries in operation in the U.S., the vast majority of which are described as microbreweries or craft breweries. Over the past decade the craft beer industry has burgeoned to a $23.5 billion annual market. Aegir set out to locate the best possible equipment to fill this void. The company now successfully manufactures, integrates, installs, and provides startup for the most efficient and complete brewing systems serving the craft brewing industry. Central to the process is the employment of the Belgian-manufactured Meura mash filter which is used in lieu of a Lauter Tun commonly used in the craft brewing industry. The Meura filter offers many advantages over the Lauter Tun, leading to more efficient and higher quality beer production. Included among them are higher throughput capacity, higher grain extract efficiency, and the capability to use a more diverse grain bill. As a result, the overall cost per barrel is reduced, the quality of the product is superior, and the consistency from batch to batch remains intact. Equally as important, the ability to use certain unconventional grains with the Aegir-Meura system gives the brewer more flexibility to create more complex, unique, and sophisticated flavors. For the Meura mash filter to be utilized a significantly finer grind was required of the grain itself. Typically, the industry primarily employs roller mills to create the desired size distribution for the Lauter Tun process. The typical roller mill and Lauter Tun realizes about an 80-85% extract yield, and the best roller mill and Lauter Tun equipment is capable of a maximum of a 92% yield. Simply put, between 8% and 20% of the grain extract is not being fully recovered with the employment of a roller mill leading to additional amounts of grain being required for the production of every batch. To improve the process and lower the cost of each barrel produced Aegir turned to Buffalo, NY manufacturer Schutte Hammermill. In business since 1928, Schutte Hammermill manufactures over 200 different models of size reduction equipment in sizes ranging from benchtop units to heavy industrial models. Aegir tasked Schutte with providing a compact yet durable machine capable of achieving the desired hourly production rates to mirror the rest of their brewing system’s capabilities. The equipment needed to produce the finer particle size distribution to maximize the efficiency of the Meura mash filter system. In addition, the fit and finish of the machine had to match the high quality of the other components of the Aegir system. 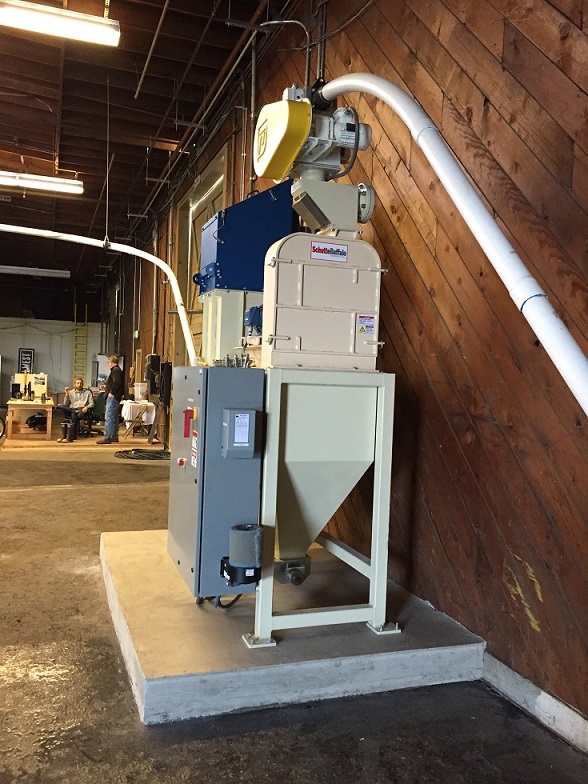 Dan Sullivan, sales associate at Schutte, recommended a 10-hp, model 18-7-301B “Circ-U-Flo” mill design that features a perforated screen that wraps around approximately 300° of the rotor's grinding circle. This design allows the production of the highest amount of material per horsepower employed. The grinding rotor featured four-way reversible hardened hammers for the longest possible service life, thereby reducing downtime and maintenance costs. To address Aegir’s other goals, Sullivan consulted with Schutte’s director of engineering, Mark Podgorny, to fine tune the mill design. Given the nature of the application, Podgorny recommended that smaller diameter welding wire be used to allow for smoother, more aesthetically pleasing welds. Further, Podgorny’s engineering team provided modifications to the mill’s base which allowed it to be seamlessly integrated into the balance of the Aegir system without the need for custom transitions that would have added to overall system cost. Lastly, Schutte painted the equipment a custom color to match the color scheme of the balance of the Aegir system. For easy cleaning between batches the entire front door of the mill hinges open to allow easy access to the mill’s interior. When required, screen change-out is also easily addressed in just minutes through the same hinged door. With so many grain recipes within the craft brewing industry the ability to easily clean and service the machinery was paramount in Aegir’s decision to select the Schutte equipment. Just as importantly, the equipment supplied by Schutte Hammermill was designed to be completely dust-free. Dust-free operation is of critical importance for a variety of reasons including maintaining a sanitary condition for a product for human consumption and promoting a safe working environment. Since many a craft brewer’s equipment is on display for customers it is also important to have a cosmetically pleasing system while in operation with minimal housekeeping required. The equipment supplied prior to the conversion to that supplied by Schutte was dusty and significant amounts of time were spent cleaning around the equipment. Grain that leaked from the equipment obviously did not end up in the mash resulting in an even lower grain yield. Aegir refers to its system as the “Ferrari-Mercedes of the craft brewing industry” and the Schutte hammer mill is viewed as an integral component of this first class package. Since the implementation of the Schutte hammer mill, Aegir brewhouses have consistently delivered above 98% extract efficiency and 100% is not uncommon. The higher grain utilization is achieved due to the finer particle size distribution produced by the hammer mill vis-à-vis the roller mill and the Meura mash filter. The roller mill used previously produced only 11% -60 mesh output material, whereas the hammer mill produces over 90% -60 mesh. The improvements in grain utilization allow for a rapid payback of the equipment. As an example, a typical operation producing 1000 brews per year, with each batch requiring 1000 lb of malt (1 million lb annually) can realize savings of between $30,000 and $100,000 with the hammer mill and Meura mash filter combination. A brewer operating a roller mill with only 80% grain extract efficiency would require an additional 200,000 lb of malt per year. At 55 cents per pound this would equate to $110,000. A 92% efficient roller mill would require an additional 80,000 lb or $44,000. A hammer mill at 98% efficiency would require only 20,000 lb or $11,000 of additional grain expense. Sharing of information between craft brewers as to best practices helps achieve this as does aligning with only the best industry equipment suppliers. Partnering with quality manufacturers such as Meura and Schutte Hammermill allows Aegir Brewing Systems to provide the brewer with the most flexibility and efficiency when it comes to its unique recipes and thus insures that the craft brewing industry will continue to flourish. Thomas E. Warne is consultant to the sales department, Schutte Hammermill. For more information, call 800-447-4634 or visit www.hammermills.com.